Bloom and Blossom knows the importance of a positive bath, book and bedtime routine in helping your little one sleep well and dream big. 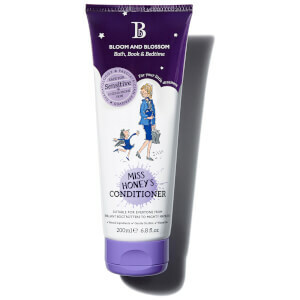 Created in collaboration with The Roald Dahl Story Company, the Bloom and Blossom Matilda's Miracle 2-in-1 Detangler Conditioner is inspired by the empowering, brave and unique character, Matilda. Dermatologist and paediatrician approved, the multi-tasking formula effectively eliminates knots and tangles without tears or tantrums to leave hair feeling soft, smooth and delicately scented. Infused with the brand's signature fragrance, which blends relaxing and calming notes of Sweet Orange, Eucalyptus, Bergamot, Satsuma, Lavender and Patchouli. Suitable from newborn. Safe for sensitive and eczema prone skin. Made in Great Britain. Not tested on animals. No parabens, SLS, colourants or petrochemicals. Spray all over damp hair and comb through. Do not rinse. Leaves hair conditioned, tangle-free and smelling phenomenal.